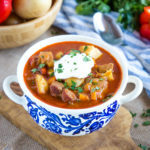 This Homemade Hungarian Goulash Soup recipe is the perfect classic cold-weather soup that's hearty, full of flavour, and so easy to make! Heat a large heavy-bottomed pot (cast iron dutch oven pots are PERFECT for this recipe) over medium heat. Keep at least 3 tablespoons of the bacon fat in the pot (feel free to drain the rest if there's too much, and if there isn't approximately 3 tablespoons of bacon grease left, add a little olive oil). Season the pork cubes with salt and pepper, and add them to the hot pan, browning them in the bacon fat on all sides. Be careful not to overcrowd the bottom of the pan, or the pork will steam and not brown. Brown in batches, if needed. Remove the browned pork cubes to the plate with the bacon and add the onions, carrots, garlic, and paprika to the pot. Saute the veggies until the onions are soft and translucent and the carrots are beginning to soften. Add the beer and de-glaze the bottom the pot, scraping up all those brown bits left behind after cooking the meats and veggies, combining them with the veggies. When the beer has reduced a little bit, add the bacon and pork back into the pot and stir everything together. Separate about 1/3 cup of the room temperature chicken stock and stir the flour into it with a fork until the flour is dissolved. Add that mixture to the pot, along with the rest of the chicken stock and the tomato sauce. Add the pickled roasted red peppers and the potatoes to the pot and stir everything together very well to combine. Turn the heat to low and let the stew simmer for about 35-45 minutes (or even longer if you have the time - up to 2-3 hours), stirring regularly, until the potatoes are cooked through and the stew has thickened up slightly. Serve hot with a dollop of sour cream on top and some chopped fresh parsley, with crusty bread for dipping. This stew freezes well, stored in airtight containers, for up to 2 months. Store it in the fridge for up to 3 days after cooking (for meal prep).